Microsoft doesn't need a deal with Hollywood to create a feature film. The ill-fated Halo movie may have already received its 21-gun salute, but that hasn't stopped 343 Industries from forging ahead with its theatrical efforts. 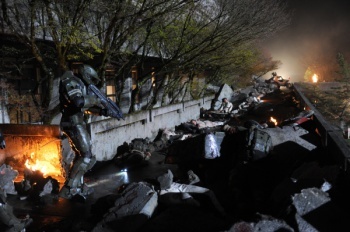 Earlier this year, Microsoft announced Halo 4: Forward Unto Dawn, a five-part live-action web series set in the Halo-verse. Judging from the ambitious scope of the project, the concept of a full-length Halo film may just come to fruition. The series, which was filmed in Vancouver, likely cost between $5 million and $10 million to produce, according to insider estimations. Tom Green takes on the lead role as a cadet in a UNSC military academy, with Daniel Cudmore donning the iconic Mjolnir armor as Master Chief. Forward Unto Dawn is a prequel to the Halo trilogy. The story revolves around the first contact with the Covenant, the long-standing alien villains of the series. Director Stewart Hendler aims to humanize the series, rather than continue the larger-than-life feel of the games. "I wanted to bring a sense of reality and gravity to the world," Hendler explained. "Everything from the performances to the aesthetics should be tethered to a sense of authenticity and grittiness." Despite the new tone, the live-action adaptation will be taking no artistic liberties with the existing lore - 343 has made sure of that. "They were checking every costume stitch, the placement of LEDs on the guns, and the bevels on the visors," Hendler said. Microsoft has partnered with Machinima to get the series to viewers. The first webisode is scheduled to go live on October 5, with new installments airing weekly leading up to the release of Halo 4. Special editions of the game will include Forward Unto Dawn compiled into a movie with 15 minutes of additional footage. The complete film will also be available on DVD, Blue-ray, and digitally.